South Queensferry Rotary Club has been shocked and saddened by the sudden death of long-standing member David Batty. David was awarded a Paul Harris Fellowship, one of Rotary’s highest honours. 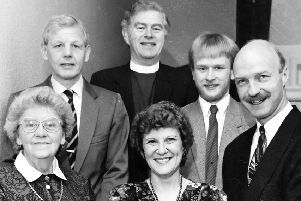 He also served for several years on the board of Queensferry Churches Care in the Community. Only days before his death he gave a fascinating talk to the club on ‘Scaling the Heights’, the book he had co-authored to mark the centenary of the death of Hugh Munro, who listed Scottish mountains in the 19th century. David was born in Manchester in 1944 where his father fought in boxing booths to supplement the family income. Moving with his mother to Scotland on his father’s early death, David went to school and studied in Glasgow. After an accounting apprenticeship he was recruited by the finance director of Babcock and Wilcox at Renfrew. He rose quickly in the finance department, at one point being responsible for paying out in excess of £1 million in cash every Friday pay day with the constant threat of an armed raid. Some years later David was awarded an MBA from Strathclyde Business School. In 1986 David joined the team from Babcock and Thorn EMI preparing a bid to manage Rosyth Dockyard which was to be privatised. The bid was successful and David became finance director of Babcock Thorn Ltd. In 1990, under David’s guidance, Babcock bought out the Thorn EMI interest and the company operated as Rosyth Royal Dockyard PLC, paving the way for the subsequent construction of two new aircraft carriers, the largest ships ever built for the Royal Navy. During his ten years at Rosyth, David played a leading role in the achievement of more than £50m company profit. David was president of Scottish Engineering during 1997 and 1998 and also served as vice-chairman of the board of management at Lauder College between 1998 and 2002. He completed the Munros for the first time on Beinn na Lap in 1994 and joined the Munro Society in 2007, becoming its president this year. David died while hillwalking with friends. The Scottish mountains and the Munro Society have lost a great friend. A proud father and grandfather, David is survived by his first wife, Margaret, his daughter, Elaine, and son, Stuart, and grandchildren, Melanie and Oscar. His second wife, Jane, predeceased him.